If you’ve driven a car or ridden your bike around Colorado Springs, you are probably already well aware of how bad the roads can be. Colorado Springs potholes are dangerous road hazards for everyone, but especially bikers and motorcyclists. Just ask cyclist Aaron Agius. While trying to avoid a pothole on his bicycle, he was hit by a car and injured. The pothole was 3 feet in diameter! In fact, the pothole problem in Colorado Springs is so bad that it is causing serious damage to automobiles as well. Now the city of Colorado Springs Streets Division is taking matters into their own hands. They have recently released a 5-year plan for repairing the roads in and around Colorado Springs. The worst roads in the city made it to the top of the list for immediate repaving, while others will have to wait a while to get repaired. The Streets Division’s plan also ensures regular maintenance of the streets at appropriate intervals to help stretch the city’s already limited budget. Just how bad are the streets in Colorado Springs? An estimated 60% of city roads needed overlay and more than 84% needed some type of maintenance to ensure drivers’ safety. The City of Colorado Springs Street Division is responsible for maintaining more than 4,725 miles of city streets. Last year alone, they filled more than 25,000 potholes in the city, and this year they are due for a record year. 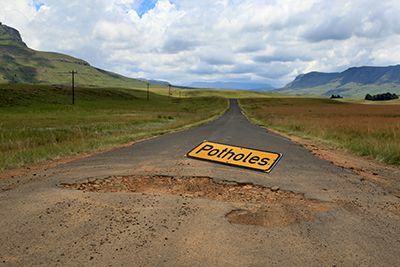 They anticipate more potholes in 2015 than ever before. Already, they’ve filled 6,281 potholes in January and February alone. Cities like Colorado Springs are responsible for maintaining and repairing city roads. When they fail in this duty or neglect their duty to keep the roads safe, they can be held responsible for catastrophic and deadly accidents that occur. Unfortunately, proving that a government entity is to blame for a car accident or bicycle accident is a difficult and lengthy process. As such, you need an experienced Colorado Springs personal injury lawyer on your side immediately to begin building you case and avoid missing any critical deadlines. If you or someone you love has been injured in a car accident and you believe the road conditions were to blame, it is imperative that you speak with an experienced Colorado Springs lawyer immediately. Contact the experienced Colorado Springs personal injury attorneys at the Green Law Firm today to schedule a no-obligation consultation and discuss your case. Call us today at 1-719-694-8515.